One thing that is refreshing about the series is that this post-apocalyptic world doesn’t have zombies, vampires or aliens that have come to conquer the Earth unlike so many of the feature films being produced these days. Last Man on Earth, starring Will Forte, takes place in the year 2020, after a virus has wiped out most of the human population. Forte plays Phil Miller, who, after the apocalypse, decides to take a trip to find other survivors. He eventually goes to Tucson, but when he can't find anyone he decides to end his life. However, this is when Carol (Kristen Schaal) comes into the picture. Realizing they are probably the last 2 people left, they decide that they will marry and repopulate the Earth. However they were right and soon, we also meet Melissa (January Jones) as well as Todd (Mel Rodriguez). Phil becomes obsessed with trying to get with Melissa, even though she is clearly not interested and she actually winds up with Todd. Along the way, we meet some other survivors as well. One thing that is refreshing about the series is that this post-apocalyptic world doesn't have zombies, vampires or aliens that have come to conquer the Earth unlike so many of the feature films being produced these days. In fact, everything seems pretty well intact considering the fact that no one is around to take care of anything. It instantly reminded me of the 1980s film, "Night of the Comet". No one around at first; leaving characters to indulge themselves and do whatever they want. The planet was intact except for the fact that the people were missing. I think the show did a great job of conveying what the loneliness would be like in this situation; how you may behave while no one is looking, etc. And while one would think that someone who is all alone in the world would be over the moon to find other survivors, Phil just doesn't seem to appreciate it. He is a miserable person to everyone he comes across even though you would think he would be grateful to find out he isn't the only one left. Commentary on "The Elephant in the Room"
Commentary on "Screw the Moon"
While there were points in the season that were a bit of a low for me, I definitely will be tuning in to watch the new season. I felt that at the end of Season One the show was worth sticking out, and the talented ensemble cast impressed me. Miller and Schaal have good comedic timing, which makes the show entertaining. If you haven't seen the show yet, I suggest you get the DVD and catch up as Season Two is getting set to beginning. 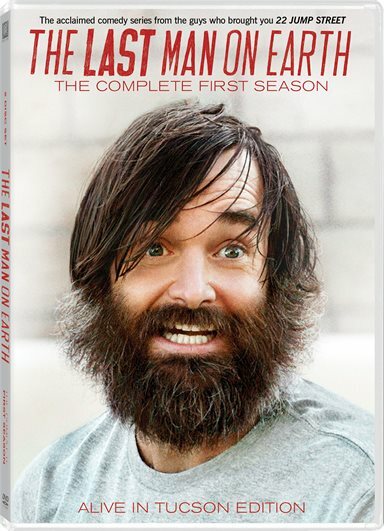 Download The Last Man on Earth: The Complete First Season from the iTunes Store in Digial HD. For more information about The Last Man on Earth visit the FlickDirect Movie Database. Maureen's taste in film and television is across the board; from horror to romantic comedies, drama to science-fiction, she likes them all. Read more reviews and content by Maureen Buccellato.